On a credit card I have a starting balance of $4,413.36. I have a goal set up to pay it off every month. However, the goal thinks I must pay $4,413.56. Why? Shouldn't the goal take into consideration the payment that came in? A card with "paid-in-full" status has money reserved to pay the entire account balance. That way, you could pay the account... wait for it... in full. 🙂 The Payment category Available should match the account balance (as a positive number) in this case. If you only have enough reserved in the category (the Available amount) to pay the statement balance, you're riding the CC float. You don't have to pay more than the statement balance (what they asked for). However, you should be able to do so (and certainly can if you wish). I do have enough to cover the previous statement ($2,058.32 paid) and the next ($2,344.24 not yet paid), but I don't see how that matters for the calculation. I still don't understand why the payment (a.k.a, a transfer from checking to credit card) isn't considered in the calculation for "Available". The "Available" in my case is currently -$2,058.32. In my estimation, it should be 4,413.56 - 2,058.32 = 2,355.24, a positive number in the Available category. That would, at this time, match my next statement and I could budget for it. I understand as the month moves forward that this Available number would increase as new charges are accrued, but it should be $2,355.24 + new charges — not negative $2,058.32 + new charges. This feels like a bug. I want to make sure I fully understand what's going on here. Would you mind posting a screenshot of what you're seeing? You budgeted the $4,413.56 to pay the goal in full, then made the payment for the $2,058.32 and the category is showing as overspent? Slate Blue Saxophone I'm afraid it sounds more like user error. It's extremely common that people neglect to reserve money to pay off the starting balance on the card. YNAB only reserves money for the budgeted purchases made after starting to use it. If you want to pay off more than those recent purchases, you need to explicitly budget to increase the amount you are able to pay. The issue is that you sent the CC $2058 more than was available . That means that you sent them money that is elsewhere in the budget (usually categories). That's what the red payment category is trying to show you. How do you know you have enough to cover the previous and next statements? I'm not doubting there's at least that much in your checking account, but the crucial piece you seem to be missing is all that money is already spoken for. Assuming TBB = $0, you have made a plan for every dollar you have. The problem you didn't include enough in the plan for how much you would reserve to send to the CC. Again, that's why the Payment category is negative/red. At the very least, you should move money from one or more green categories (or TBB) to put the CC Payment category to $0. The reality is that money is already gone (sent to the card). You have a payment for $2344 coming up in roughly 3-4 weeks (I would guess). Do not pay more than the CC Payment category says at that point. You can raise it with normal budgeted purchases. You can also raise it by directly budgeting to the category. Hopefully between those two things, it will meet (or exceed) $2344. This is what's known as "Riding the CC float". If the Payment category Available is less than $2344 (and you won't/cannot move funds to increase it further), you have no choice but to pay less and incur interest. To make matters worse, that's not even your final target. A paid-in-full card should have the payment category equal to the entire account balance (as a positive number). If you raise the category to $2344 via budgeted purchases, that also raises the account balance. (No free lunch, unfortunately.) The ONLY way to make real progress is to raise the payment category via budget entries. Faness Pretty sure OP didn't budget anything for the starting balance (CC Payment category was $0) but paid the statement balance anyway. Thus, still needs to budget $4413 to reach paid-in-full status, or budget $2058 to ride the CC float interest-free for another month. Faness Not exactly... My Credit card account has a starting balance of $4,413.56 and has one transaction, a payment from Checking, for $2,058.32. On the Budget screen, the Credit card category is showing I've overspent because the Available column shows -2,058.32. But I really have +2,355.24 still charged up and waiting to be paid. I would expect the Available column to show that +2,355.24 and, if it did, I'd be able to budget that amount and bring the Available down to $0. dakinemaui Well I've pondered what you've been saying and I suppose that if the software is designed to push me to account for last + this statement + anything new, it's like keeping me ~2 months ahead. The logic still irks me though - it still feels like the Payment/Available column should drop if a payment comes in. And it should match the goal remainder. I also see now that the TBB amount doesn't drop when a transfer happens. That also seems strange, but it accounts for why, as you say, I must budget for it in the credit card category manually. Well I've pondered what you've been saying and I suppose that if the software is designed to push me to account for last + this statement + anything new, it's like keeping me ~2 months ahead. It's not about keeping you two months ahead. It's about ensuring that all of your spending is covered by money in your budget. That includes credit card payments for spending you did on your credit card before you started YNAB. The money for that comes from somewhere. You can't use the same dollars to make that payment and also pay for something else. YNAB won't move the money around in the budget for you. It seems that you are relying on future income to make your credit card payment for purchases in the previous month, rather than using current income to cover current credit card purchases. This is riding the credit card float. YNAB is telling you right there in the tool tip you need to cover the credit card payment by budgeting money. You need to re-read and digest what dakinemaui wrote because it is spot on. Most people go into shock or a bit of panic when they first realize they've been relying on the credit card float (and what that actually means). I know I did. I can still remember the exact amount of my credit card float from 5 years ago. I played with a test budget and now I think I have a better understanding of this tool. It's a bit mind-bending simply because it looks like a ledger but doesn't act like one. In my mind I have been thinking of my checking account – in it's entirety – as TBB. Because, that's where I pay everything from. In other words, everything in my checking account is fair game to be used to pay for expenses. So, my expectation at first was when a paycheck comes in TBB increases and when a payment leaves TBB decreases. However, I realize now that each individual record will be categorized separately. And that payment to the credit card (a negative transaction for Checking) isn't and cannot be categorized as a TBB. If it could then it would subtract from the overall TBB, in theory. That means I must specifically, and manually, account for that payment in a budget – the credit card budget – to balance everything out. I think I'm sort of getting this. But it's a bit mind bending. The confusing part of this is the tool knows that there was a transfer from Checking => Credit card. It's forced, there's no turning back, so I have no choice but to budget for this transaction. Why doesn't the the Credit Card budget end up automatically adjusted with that transferred/payment amount? And, why isn't there a convenient "quick budget" option available to use the recently transferred payment? Slate Blue Saxophone The budget is the plan for future spending. The CC Payment Available does automatically adjust to show the transferred amount, and also highlights in red when that payment is incongruent with the plan/budget. There is no convenient "quick budget" option, because YNAB cannot possibly know from where else in the budget the funds to support that overpayment will come. I think you would really benefit from some of the getting starting videos that discuss how the program is intended to operate. TBB, for example, is the "unplanned" money, and the first thing you should do is drive that to $0. dakinemaui I was thinking the budget, not available, should be adjusted automatically since YNAB does know that there was a transfer for a payment and I have no choice but to budget for it. Slate Blue Saxophone The budget is your plan for the dollars. So you indicate you want $400 of your dollars to be reserved for buying groceries by budgeting $400. The available is how much is left out of what you budgeted. When you buy $150 of groceries, $250 of the $400 is left. Definitely access the getting started materials. There are live classes, recorded videos, and reading material to suit however you best learn. I was thinking the budget, not available, should be adjusted automatically since YNAB does know that there was a transfer for a payment and I have no choice but to budget for it. Nope. YNAB expects you to explicitly come up with a plan before you execute it. It will only correct for your plan deviations when you change to the next month. It's a common yet mistaken assumption that YNAB will "fix it for you" in real time. One of the risks of not maintaining your plan yourself will be spending money you don't have... or making a credit card payment with money you need for something else. That Payment/Available is how much you have reserved for your next payment, and it does drop when you make a payment. (Just like the Electric category Available drops when you pay the electric bill. Having the entire account balance reserved (i.e., paid-in-full status) isn't keeping you 2 months ahead, it's keeping you 0 days ahead -- just as if you had used a debit card for that purchase. In actuality, you are currently ~2 months behind. I would say, though, it's not YNAB's doing. Being 0 days ahead is how a paid-in-full CC setup operates. It's becoming apparent that you cannot treat this card as paid-in-full today, so configure the budget so you can meet your upcoming obligations, budget what you can to the CC, and then pay what is Available. Keep doing this and work toward paid-in-full status over time. TBB is the money that doesn't have a job yet. Normally you would send the CC the money that has been assigned the job of paying the CC bill, so it doesn't need to reduce TBB. In this case, you're in a bit of "limbo", because you sent the CC money that had other jobs, but you haven't yet changed the job descriptions (moved money from other categories to the CC Payment category). In your case, you haven't assigned any money to any jobs yet. Your first order of business should be to budget $4058.32 to cover the red category. Then make a plan with the rest. That means allocate dollars to categories in accordance to your future spending needs until TBB = $0. There is a detail that I think is adding to my confusion in this thread. I happened to start YNAB at a point when the credit card's account included a payment but the checking account hadn't yet cleared, but did so later. YNAB originally saw $2,355.04 for my Credit Card when the transactions downloaded, but later I manually adjusted it to $4,413.56 because I thought that was necessary. 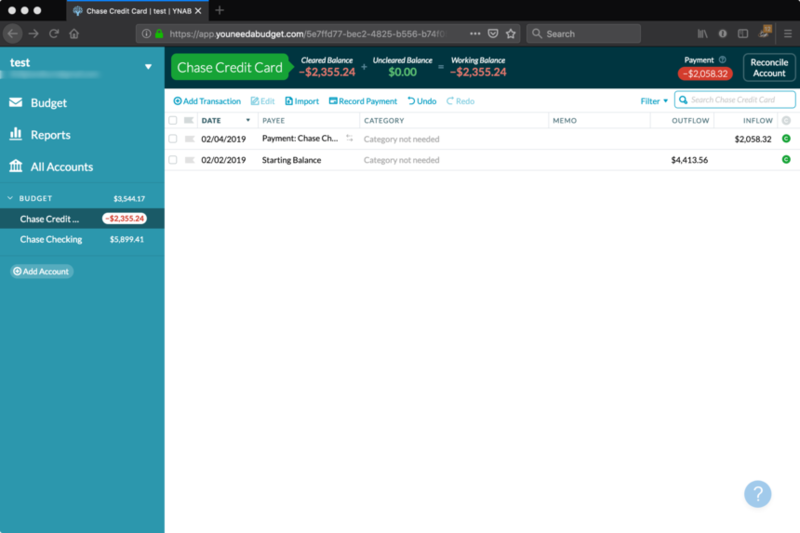 Jan 31 – Credit Card balance: $4,413.36. Feb 1 – Credit Card auto payment occurs, $2,058.32 is paid. Feb 2 – YNAB trial begins. Starting balance is $2,355.04. Feb 4 – Payment in Checking clears. YNAB shows $2,058.32 transferred to credit card as payment. If I did nothing, it appears that the starting balance already includes the payment and then the payment is applied a second time once the transaction finally clears in the checking account. What should I make the starting balance for the Credit Card be? Or is it correct as it is on Feb 2? Or should I delete the Checking transfer since it's technically a duplicate? Slate Blue Saxophone Your starting balance for the CC account should be $4412.36. It's simpler to change the starting balance than trying to explain the changes to the payment transaction you would need to make. This still doesn't change the fact that if you are a Pay In Full CC user you will need to budget for your entire starting balance as was explained above. The others are exactly right! Since that spending came in before YNAB, you have to budget for it directly in the credit card category. Since you made the $2,058.32 payment, that needs to be entered in the Budgeted column of your credit card category. When you plan to pay the remaining $2,355.04 off, you'll need to budget for that as well. 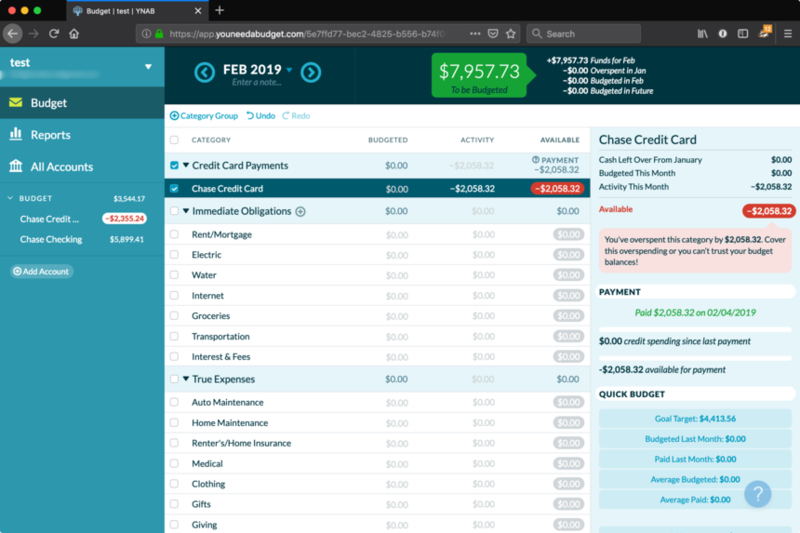 Your checking account had a starting balance of $7,957.73, but only $5,602.69 should have been budgeted towards your spending categories - the remaining $2,058.32 needed to be budgeted towards your credit card to cover that payment.